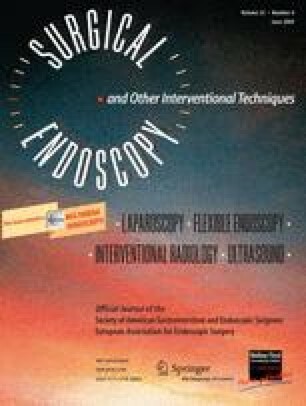 Anastomotic and staple line leaks (ASL) occur after laparoscopic Roux-en-Y gastric bypass (LRYGB) with a reported incidence as high as 6%. Leaks are the second most common cause of post-LRYGB mortality after pulmonary embolism, and can be associated with significant morbidity. Prevention and early detection may limit both morbidity and mortality. A retrospective analysis of prospectively collected data was performed on all LRYGBs performed in a community hospital by a single surgeon from August 2001 to December 2005. All operations were performed using a linear-stapled anastomosis with buttressing material, handsewn otomy closures, stay sutures, intraoperative leak testing, and fibrin sealant. 760 patients underwent LRYGB during the study period. Eighty-nine percent (n = 674) were female and 11% (n = 86) were male. Mean body mass index (BMI) was 50 kg/m2 (range 36–83 kg/m2). Mean age was 40 years (range 17–72 years). Two patients developed three gastric pouch staple line leaks (0.4%). There were no mortalities. Operative technique, including appropriate staple sizing, staple line reinforcement, handsewn otomy closures, placement of stay sutures, intraoperative leak testing, and placement of fibrin sealant contributed to a lower than expected incidence of ASL after LRYGB in this series.